Provides a word list and definitions; a simple alphabetic pronunication system; sample sentences and phrases; homonyms, synonyms, prefixes, and suffixes; and grammar information. 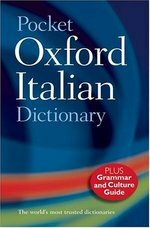 Authoritative and up to date, this third edition of the Pocket Oxford Italian Dictionary covers over 90,000 words and phrases, and 120,000 translations of contemporary Italian and English, with dozens of brand-new words in each language. 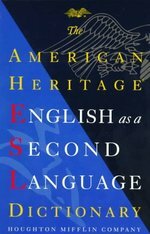 More than just a dictionary, it also includes sections on Grammar, Culture, and Communication. The grammar supplement provides full information on all the key points of Italian and English grammar, including verb tables for quick reference. Language is now studied in the context of its culture, so the existing culture section has been revised and expanded to offer lively and useful information on life in the Italian-speaking world--everything from political institutions to how weddings are celebrated. The communication supplement gives help with all types of correspondence, including examples letters, emails, resumes, and even help with text messaging in Italian. The Pocket Oxford Italian Dictionary is the perfect reference for student and adult learners needing an affordable, portable dictionary. Over 70,000 entries Thoroughly revised and updated 1,000 new words and meanings Over 400 photographs and illustrations Expert guidance on correct usageBased on the bestselling American Heritage(r) Dictionary of the English Language, Fourth EditionAmerican Heritage(r) dictionaries are widely known as the most innovative and informative dictionaries in today's market. This all-new fourth edition of the best-selling classic continues that tradition with its clear and precise definitions, its expert usage guidance, and its wealth of illustrations. 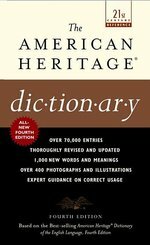 Newly updated to reflect our changing language, this revised edition is the most up-to-date and authoritative dictionary available today. More than a thousand new entries for such terms as "e-tailer, zine, bioreserve, chatroom, red card, domestic partner " More biographical and geographical entries than any other paperback, thoroughly updated for the new millennium The most lavishly illustrated dictionary on the market -- with over 400 images Expert usage guidance based on the American Heritage(r) Usage Panel Regional notes from around the country Hundreds of synonym lists, fascinating etymologies, and much moreAmerican Heritage(r) Dictionaries. Setting a new standard."